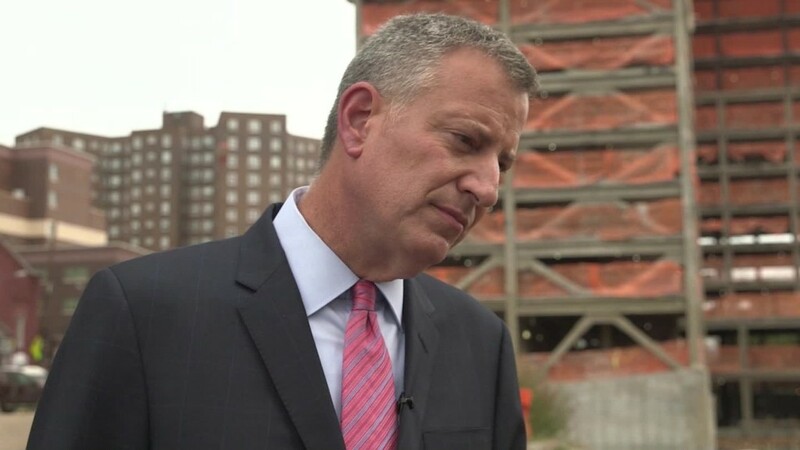 If America wants a healthy economy and thriving middle class, it needs to reward work, not wealth, New York City Mayor Bill de Blasio told CNN. That mantra is at the heart of the Progressive Agenda, which de Blasio and others are pushing to combat widening income inequality in the U.S.
"You are talking about a middle class that for several decades has been economically stuck," said de Blasio. "They can feel their possibilities slipping away. And that is not the America they signed up for." Stabilizing the middle class is essential to growing the economy, said Robert Reich, the former Labor Secretary for the Clinton Administration who joined de Blasio in speaking with CNN. And when the middle class is expanding, the poor have an easier time climbing the ladder, he said. But the middle class has been struggling. This is the first time that median income has not recovered five years into an economic recovery, Reich said. "[The economy] is not going to grow if the middle class does not have enough purchasing power to keep it growing," said Reich, who is now a professor of public policy at the University of California at Berkeley and also a proponent of the Progressive Agenda. "The middle class doesn't have the money. People are angry." -- Helping workers get ahead by raising the minimum wage to $15 an hour, passing comprehensive immigration reform to protect low-wage workers against exploitation and investing in schools. -- Supporting working families by passing national paid sick and family leave, expanding the Earned Income Tax Credit and making pre-K universal. -- Enacting tax fairness by closing the carried interest loophole that allows hedge fund managers to pay a lower tax rate on their income, implementing the "Buffett Rule" so millionaires pay their fair share and ending tax breaks for companies that ship jobs overseas. De Blasio, who took office in January 2014, has already expanded paid sick leave and universal pre-K, which is still ramping up, in New York City. The mayor also supports raising the minimum wage to $15 an hour for all workers, a central tenet of the Progressive Agenda. New York Governor Andrew Cuomo recently lifted the wage of fast-food workers to that level and is pushing to expand it to all industries. Raising the minimum wage will help the economy by giving these workers more money to spend, Reich said. It will also save the government money because they will be less reliant on public assistance programs. The raises, however, can come at a price. Walmart (WMT), which increased its base wage to $9 an hour in April, had to lower its profit forecast recently, citing wage hikes as one of the reasons. Opponents say raising the rate will cost jobs and make it even harder for teens to find work. Reich and de Blasio counter that view, saying these workers will have more money to spend, which will create new jobs. "Part of why so many of us believe in the $15 minimum wage is ... it actually puts people back in the game of being able to support themselves and have a shot at the middle class," de Blasio said.